Background map courtesy Cartography Associates: Edwin James and Stephen Long, Country drained by the Mississippi, Eastern Section, 1822. Carey and Lea Philadelphia. When people think of earthquakes in the United States, they tend to think of the west coast. But earthquakes also happen in the eastern and central U.S. The most seismically active area east of the Rocky Mountains is in the Mississippi Valley and is known as the New Madrid seismic zone. Since 1974, seismometers, instruments that measure ground shaking, have recorded thousands of small to moderate earthquakes. The faults that produce earthquakes are not easy to see at the surface in the New Madrid region because they are eroded by river processes and deeply buried by river sediment. A map of earthquakes epicenters, however, reflects faulting at depth and shows that the earthquakes define several branches of the New Madrid seismic zone in northeastern Arkansas, southwestern Kentucky, southeastern Missouri, and northwestern Tennessee. Map of New Madrid seismicity. Epicenters of earthquakes since 1974 shown by red dots. Approximate locations of large historical earthquakes shown by black crosses. (Click map to download larger PDF version). 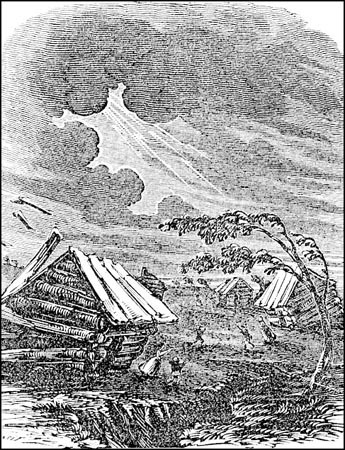 In the winter of 1811 and 1812, the New Madrid seismic zone generated a sequence of earthquakes that lasted for several months and included three very large earthquakes estimated to be between magnitude 7 and 8. The three largest 1811-1812 earthquakes destroyed several settlements along the Mississippi River, caused minor structural damage as far away as Cincinnati, Ohio, and St. Louis, Missouri, and were felt as far away as Hartford, Connecticut, Charleston, South Carolina, and New Orleans, Louisiana. In the New Madrid region, the earthquakes dramatically affected the landscape. They caused bank failures along the Mississippi River, landslides along Chickasaw Bluffs in Kentucky and Tennessee, and uplift and subsidence of large tracts of land in the Mississippi River floodplain. One such uplift related to faulting near New Madrid, Missouri, temporarily forced the Mississippi River to flow backwards. In addition, the earthquakes liquefied subsurface sediment over a large area and at great distances resulting in ground fissuring and violent venting of water and sediment. One account of this phenomena stated that the Pemiscot Bayou "blew up for a distance of nearly fifty miles." "After the earthquake [of 1811-1812] moderated in violence, the country exhibited a melancholy aspect of chasms, of sand covering the earth, of trees thrown down, or lying at an angle of forty-five degrees, or split in the middle. The Little Prarie settlement was broken up. The Great Prarie settlement, one of the most flourishing before on the west bank of the Mississippi, was much diminished. New Madrid dwindled to insignificance and decay; the people trembling in their miserable hovels at the distant and melancholy rumbling of the approaching shocks." From Henry Howe, Historical Collections of the Great West (Cincinnati, 1854, p.239).